The American military is bad at teaching others how to fight. 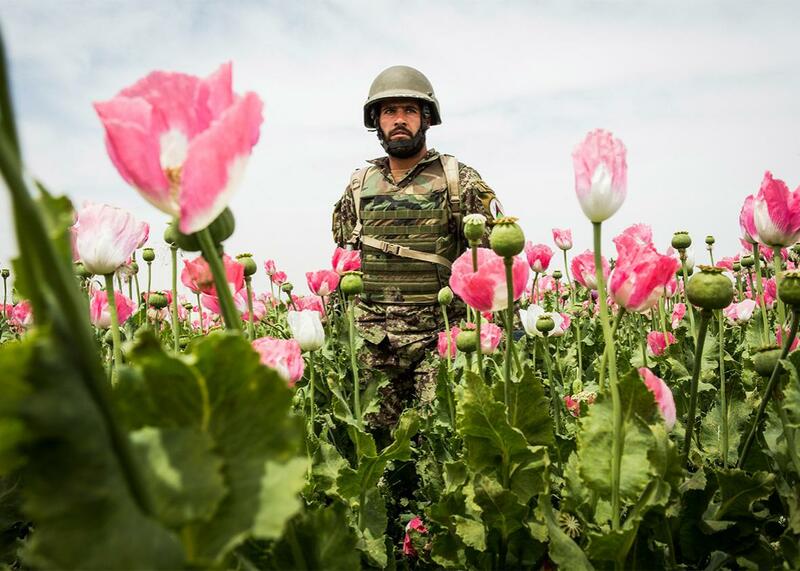 A soldier in the Afghan National Army walks through a poppy field during a joint patrol with the U.S. Army on April 5, 2013 in Afghanistan. Obama’s decision—a reversal of an earlier plan to pull out entirely from Afghanistan by the end of his presidency—was made well before the Taliban’s assault on the northern town of Kunduz, which raised doubts about the Afghan army’s ability to defend the country by itself. Senior administration officials say that, back in March, Obama ordered the Pentagon to conduct a review of how many U.S. troops would be needed to sustain counterterrorism operations in the region. The answer turned out to be 5,500, spread out on three bases (in Kabul, Bagram, and Kandahar), a calculation that Obama endorsed before the Taliban seizure of Kunduz, though that attack (and the Afghan army’s eventual retaking of the town, with U.S. assistance) sealed the deal. Three factors shaped the decision. First, in September 2014, one day after he was sworn into office, Afghanistan’s new president, Mohammad Ashraf Ghani, signed a “bilateral security agreement” permitting U.S. and NATO forces to remain in his country after the international combat mission expired at the end of that year. (Ghani’s predecessor, Hamid Karzai, had refused to sign the agreement.) On a subsequent trip to Washington in March, Ghani asked Obama to keep the troops there for longer still and promised to form a more inclusive, less corrupt government in Kabul. Second, with Ghani’s assurances in mind, Obama ordered the Pentagon review on the U.S. military presence, asking those conducting it to look at Afghanistan not so much as this country where we’d been fighting a war for 13 years but, more, as one of several partners in a global counterterrorism strategy—in this case, against the Taliban, al-Qaida remnants, and ISIS jihadists who had begun to pop up in the area. Once any foreign military commitment is made, it doesn’t take much to get troop levels up to 5,000 or so. An officer in the Pentagon, with experience in special-operations forces, calculates that a couple thousand are needed for counterterrorism operations, a couple thousand to continue training and advising the Afghan army, a thousand to staff a headquarters, and close to a thousand for “force protection”—that is, for armed forces whose job is to defend the other U.S. military personnel. Military training is more complicated than many realize. True, the Taliban, al-Qaida, and ISIS don’t require advanced training for its recruits, so, it’s often asked, why should the Afghan or Iraqi army? But the two tasks are different. Insurgents can attack at a time and place of their choosing; if met with force, they can withdraw and attack someplace else. By contrast, armies defending the government have to be strong and ready everywhere, or they need to have the means to move quickly from one place to another. So training is not just a matter of teaching soldiers how to shoot straight and maneuver on a battlefield (which American trainers do well). If the goal is to turn the fighting completely over to the local armed forces, then training must also involve teaching them how to conduct and call in air strikes, gather intelligence and apply it to tactical operations, move soldiers rapidly from one area to another (which involves flying helicopters or small transport planes), resupply soldiers when they’re deployed far from the base (logistics), and plan operations on a strategic or theater-wide level. To do all these things goes well beyond the abilities of American infantry or special-operations forces assigned to a training mission. In other words, the way we currently train, it may never be possible to make our client-armies completely self-reliant. John Nagl, a retired U.S. Army lieutenant colonel, has long called for the creation of a special advisory corps—units whose sole task would be to advise, train, and assist foreign military forces. These advisers would come to a war zone not only with combat skills but also with fluency in the local language and culture. They would help the local senior officers set up and operate a headquarters. They would help senior officials do the same in the ministry of defense. And, as Nagl envisions it, they would not only train troops on a base but also embed with small units of these troops on the battlefield. Nagl’s idea never found favor among his military or political superiors when he first pushed it 10 to 15 years ago. The generals were opposed because they didn’t want to divert good soldiers from traditional combat missions, especially with the Army’s ranks already shrinking. Some politicians paid lip service to the idea, but ultimately they acceded to the brass—and those who looked more closely were uncomfortable with the fine print. The idea of embedding American advisers with local troops evoked grim memories of Vietnam—and Nagl was acknowledging explicitly that, in the sorts of unstable countries where these advisers were likely to be deployed, they would have to stay embedded and advising for a long, long time. Few American politicians, officers, or ordinary citizens have any appetite for embedding the current teams of American advisers alongside Afghan troops (or Iraqi troops or Syrian rebels) in combat, and for very good reason. But Nagl may have a point: It’s very difficult—it might be nearly impossible—for the local troops to win, if the advising and assisting stops halfway. Then again, there are other reasons for the failure of training, and they have little to do with the lack of a specialized American advisory corps. In several of the insurgency wars we’ve joined in the past several decades, the local elites—who sign on to be our allies—are corrupt or incompetent at running their countries. The local soldiers feel little loyalty to their commanders or their leaders, while the insurgent rebels are very energized by their cause. No matter how well Americans—or any outsiders—might train and advise such soldiers, they are unlikely to win because they have no desire to risk dying while fighting. This was certainly the case when Iraqi soldiers—trained by America’s finest at a cost of billions—fled after the first gunshot when attacked by ISIS marauders in Mosul. In the same sense, the fate of the Afghan National Army will depend less on the thoroughness of American training than on the degree to which President Ghani cleans up Karzai’s corruption. Back in late 2009, when President Obama sent more troops to fight in Afghanistan, the senior U.S. officers—including Adm. Mike Mullen, then the chairman of the Joint Chiefs of Staff, Gen. David Petraeus, who was commander at the time—testified that, if the corruption persisted, the Taliban would win, no matter how many American troops joined the fight. The same is true now. For all these reasons, President Obama has been leery of military adventures. He sent more troops to Afghanistan, giving his commanders a chance to try out a new war strategy; when it didn’t work as quickly as they said it would, he withdrew the troops and ended the combat mission. He has decided to keep 5,500 trainers, advisers, and counterterrorism forces in Afghanistan for longer than he’d originally expected because the new Afghan president wants them there, signed a treaty to keep them there, and committed to run an inclusive government—and because the Afghan army isn’t ready to go it alone. The premise is to leave it up to the next American president to decide whether the commitment is still worth the effort. But there should be no illusions on one point: The Afghan army won’t be ready to go it alone for a long time and the United States isn’t prepared to make it otherwise.